The effects of the salinity of irrigation water on the productivity of mature grapevines was studied. We injected NaCl solutions into River Murray water to generate five salinity levels ranging from 0.37 to 3.47 dS m-l, with sodium adsorption ratios of between 2 and 37. These treatments were applied through a trickle irrigation system for six years to own-rooted sultana grapevines growing in a vineyard at Dareton, N.S.W. The effect of irrigation water salinity was most severe on vines growing in the most heavily textured soil, and increased with time. The yield (y) response was well described by the generalized logistic function: y = D[1+(ECi/ECih)ß]-1 where y is yield, ECi is salinity of irrigation water, D is the theoretical yield at ECi=0, Ecih is the half-effect ECi and a: is the shape parameter. Soil texture affected the response via an effect on ECih and, to a lesser extent, on ß. These parameters were related to % (silt & clay) in the final model, which was fitted for each of years 2 to 6 and accounted for 76.2% of the variance in yield. 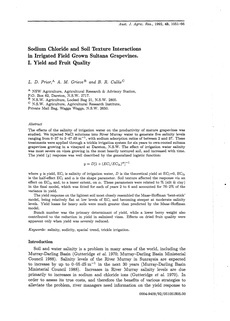 The yield response on the lightest soil most closely resembled the Maas-Hoffman 'bent-stick' model, being relatively flat at low levels of ECi and becoming steeper at moderate salinity levels. Yield losses for heavy soils were much greater than predicted by the Maas-Hoffman model. Bunch number was the primary determinant of yield, while a lower berry weight also contributed to the reduction in yield in salinised vines. Effects on dried fruit quality were apparent only when yield was severely reduced.